2/26/17 George Rideout interviews Meria out of Winnipeg, Canada. Show was recorded 2/21/17. Thanks to George we can air it hear for those who missed it. This show isn’t all about politics but includes a lot of spiritual truth. Enjoy. 17th Year on the net! Education you don’t get anywhere else – commercial/censor free. Subscribe to access/download entire site 24/7. Commercial Free because of your subscription. Support truly independent media. 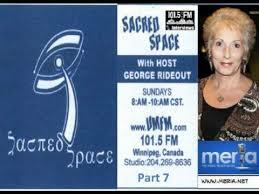 4 Responses to "Meria on Sacred Space with George Rideout"
Excellent excellent excellent show! 2 hours flew away like 2 minutes. So many precious and important information in one place. Thanks Meria! This is really an outstanding show. Wow!